Located 2 miles north of Sabetha on 6th Street or 2 miles north of Sabetha on Highway 75, then 1/2 mile west, then 1/2 mile north. The first floor was used as a grammar school and provided space for 60 students and their teacher. The second floor was used as an academy and an average of seventy students from Kansas, Nebraska, and Missouri were in attendance. A hotel and boarding house were opened to accommodate the students. At this time the area was known as Albany, Montrose, Territory of Kansas. School continued in Albany until 1962, when the students were furnished transportation to the Sabetha schools. In July 1965, the school and grounds were acquired by the newly formed “Albany Historical Society”. The second floor displays the original church pews, along with a pump organ, an old time kitchen, bedroom, parlor and bath, and a country store portrays most of the displays, although there are several glass display cases, packed with many items of interest. 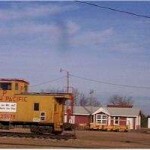 The Rock Island Railroad lines donated the depot from Bern, Kansas to the Museum. The depot through the courtesy and help of the Rock Island lines is completely equipped as an operating station. The society acquired enough trackage to build an oval track in front of the depot. A motorized patrol car, pulling three workmen’s cars, is in operation during the summer months, to give children rides. The waiting room has two original benches, 1887 vintage. 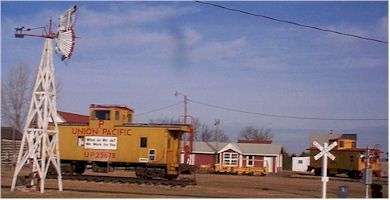 The Union Pacific donated a pot belly stove and a weigh car caboose No. 25061. 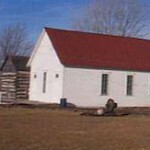 The Will Most home, along with an acre of ground was donated to the Museum, by their son, Kenneth Most, in December 1969. The house is over 100 years old, and was in use when Albany was a thriving settlement. Some of the original furniture is on display, and many more pieces of that period have been added. The Berwick school building was acquired, and moved to the present site in 1966. The Sabetha High School awards and trophies, from 1914 until the unification of district 441, are on display along with many pictures of graduations classes, and victorious football and basketball teams. Displayed on the walls are name plates of many rural schools that fell victim to progress. Another section of the school displays military items from a revolutionary bayonet, to uniforms from World War I, World War II, and some items from the Civil war. Postal service was inaugurated in Albany in 1858. 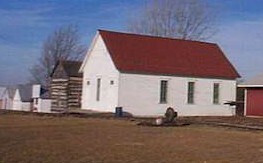 A replica of an old time post office was completed in 1975. A blacksmith shop over 75 years old was donated by the owners, Mr. and Mrs. Sam Payne, of Capioma in 1975. Many blacksmith tools, along with a forge, were also donated by Mr. and Mrs. Payne, at that time. The Ackerman building erected in 1972 measures 54 ft. by 108 ft., and houses a display of a steam engine, Rumley Oil Pull tractor, an Avery oil burning tractor, along with several grain separators, two buggies, a family carriage, several other tractors, and old time grain wagon, and many more items of interest. Another display that merits special attention is a boy and girl statue and fountain that dates back to 1878. Mr. C.L. Sherwood purchased the fountain and statue before Sabetha had a water system. A deep well was drilled at his home, topped by a wooden water tank, for pressure, and powered by a wind-mill furnished water for his home and the statue. Mrs. Carrie (Sherwood) Phipps, his daughter was the donor. 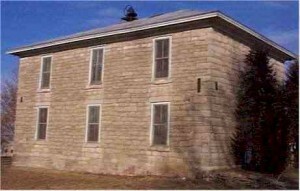 Another large metal building, measuring 45 ft. wide and 122 ft. long, with a black top floor, houses antique cars. This building was erected in 1974.